In the Spring of 2000 I left the public workforce for the final time. Throughout the years I was raising my two daughters I was mostly a stay at home mom. However there were times I worked small, very part time jobs and even went back to school for a period of time. Then I went to work when they were in upper grade school at a bank in the small town I live in. That job started out as part time as well but soon grew into full time. I loved that job and everything about it. I was a bank teller and eventually trained all of the new bank tellers. As much as I enjoyed the detail part of the work involved it was the people I really loved. My coworkers became a second family to me and I became very fond of the customers. That's what it always comes down to for me really when God plants me in a new place; it's all about the people. So when I leave a place it's the loss of daily contact with those people that I grieve. She said that if there was any problem they could call her and she would explain. Of course, there was no need. They were wonderful at the bank. Remember, my second family. God works all things out. I, however, was a bit shattered. Oh I was too sick to continue to work as far as my body was concerned but my heart and mind took a very, very long time to catch up to things. Years really. The rug was pulled out from underneath me so suddenly I felt. One moment I was working hard and laughing my way through the day surrounded by lots of people and the very next day I was too sick to get out of bed most days and eventually on disability. This was not exactly where I thought I would find myself at the age of 34. Not only was I suddenly lonely because my husband was at work and my girls were in school all day but I struggled big time with feeling that I no longer had any purpose in life and never would have again. Prior to this time not only had I worked at the bank, I had been a cosmetologist and worked in a beauty salon, I had worked in a gift boutique, helped my parents run a family owned business and done many things over the years at church such as teach Sunday school classes, lead youth group along with my husband and help lead women's ministries. I felt completely defeated. If I can't help other people in some capacity then what good am I ever going to be? That was at the heart of the issue for me always. So... what did I do? I have to admit it required the help of an antidepressant for awhile to get me over the initial hump of it all but I also needed something to do to self soothe, fill my time and show that I was being productive in some way. So once again, I picked up my knitting needles, crochet hooks and yarn. I had learned to knit and crochet both many years earlier and would do a bit here and there but hadn't had much time for it while working full time. On those days when I was home alone and adjusting to a new season of life and, quite honestly, too sick to do anything else, I would prop myself up on the couch or even in bed and knit or crochet for hours. And stitch by stitch my heart began to heal. Eventually I no longer needed those antidepressant pills. Not only was I filling my days with something I loved, my family and friends were enjoying the fruits of my labor at birthday and Christmas time so in at least that small way I felt like I was giving something to someone again. 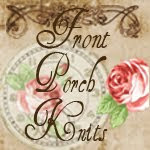 The years rolled by and I wound up taking courses to be certified by the Craft Yarn Council of America and now I teach private lessons in my home so I have knitting and crochet students coming and going from time to time and it gives me that connectedness I need with people. Plus I get the joy of teaching something I love doing so very much. Then there's my Etsy Shop as well and the local craft fair that I do along with my annual Christmas event in my home. All things considered, I am pretty pleased with the way God has grown my passion for fiber arts into a small, home based business that I can easily manage around my rollercoaster of good and bad days. No matter what direction my life has taken or will take in the future, knitting has been and will continue to be, my constant solace. My love for it has seen me through my own dark and uncertain days of redefining myself on this journey of life. My hands continuing onto the next stitch and the next one and the one after that got me through the hours of Scott's surgery when they removed the bulk of his pancreas and the days after that when he was so sick in a hospital bed, then through all of the cancer treatments that followed. Regardless of what life brings my way, I just keep stitching through it all. Has my physical health gotten better? No. But sadly, that's often the nature of long standing rheumatoid disease. A few years ago I took a medication in pill form to try to get things under better control. I didn't respond well to it and it made me nauseous literally night and day. After 2 1/2 years of feeling sick all of the time, being too thin as a result, and much prayer, I entered the world of biologics. I started self injecting Enbrel on a weekly basis 2 years ago this month. I respond very well to this medication and saw results by the second injection. I have virtually no side effects from it. However, as with many people who are on it, I am not fully remissive. It is most likely due to the fact my disease is long standing. I am much better with it than without it so I stay on it and Thank God that I live in a day and age when medical advancement makes this possible for me. After all, there's a life to be lived and I don't want to spend the bulk of my days doing it in bed. I would so much rather be enjoying my family and friends and, well, my knitting. I'm making progress in the hats this week. This is my dear friend Erin standing beneath my dogwood tree wearing the blue hat. I think the blue is stunning against her beautiful thick brown hair. It brings out her lovely blue eyes too but these pictures didn't catch that. Modeling the cream colored hat for me is my youngest daughter Chelsea once again. For those of you who remember posts with my granddaughter Gabby in them, this is her mommy. I really love the contrast of the soft creaminess of this hat against her gorgeous red hair. This hat is a slower knit than the fingerless mitts due to the fact that it is lacework but it is well worth the effort in the end. As with many of the patterns I use, I have taken the liberty to make my own changes to this here and there causing it to come out the way I prefer it. Even though it takes a little longer and requires more concentration it is still very self soothing, especially as the soft cotton yarn floats through my fingers. I can get one hat accomplished from start to finish and a good start on another one in a days time if the rest of Life doesn't crowd me out too much. And when I need a little break I take one. And always I Thank God for helping me to be the very best I can be at every changing season of my life. Thank you Bridget... your comment choked me up when I read it. God's given you a special gift. You are a smart knitter, Danette! I think knitting is VERY therapeutic. Knitting, praying, thinking. So good. Oh Pom Pom... you always see the best in me, and I suspect that's your gift... that you see the best in all people. That's a beautiful gift dear friend. Knitting is most definitely VERY therapeutic. Knitting, praying and thinking have gotten me through a whole lot. It's so hard to suddenly switch gears, and I can imagine how much harder it was because it was doctor's orders and not at all what you wanted. Life is funny, the things that come our way. While it is no doubt no fun at all to struggle with the ups and downs of chronic illness, I bet you can draw a line from having to give up that great job at the bank with where you are at today with your crafting business. And as a side note, those hats are stunning!! You know who is stunning? You are my friend. You are beautiful inside and out. I am sorry for all of your health issues but am so happy you find peace in laying with yarn, I do too as you so well know. I am honored to call you a freind Danette. Well Meredith... You have me sitting here in tears... With a lump in my throat... I think maybe the saying "It takes one to know one" applies here. I am honored to call YOU my friend as well and that comes from the bottom of my heart. Give our Little Buddy a kiss from me.